A man who protested outside Pulse nightclub Monday following a ceremony marking the anniversary of the attack was handcuffed by Orlando police. Local officials and the community had just finished a remembrance ceremony at the venue, which honored the victims and first responders. The man, who has not been identified, was part of a group of about three protesters holding anti-gay signs. The crowds chanted, “Love conquers hate,” as the man was placed in handcuffs. 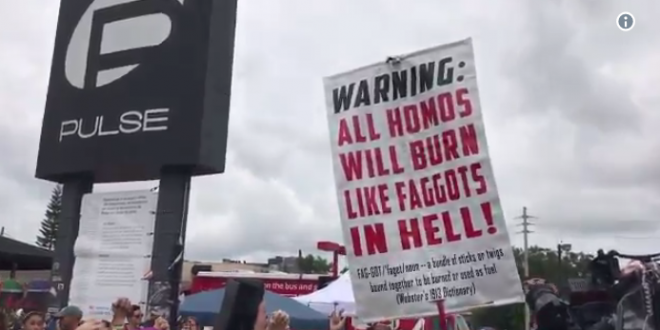 With "Christians" like these protesters on constant display, it is no wonder that nearly one third of the under 30 generations have walked away from religion. With Hampton Roads Pride events in full swing this week and this weekend, this incident is a reminder that many hate us because we challenge their myth and fairy tale based beliefs derived from Bronze Age herders in the case of Christians, and the writings of a mentally deranged individual in the case of Islam. On a more positive note, the Orlando Sentinel has a number of respectful articles on those who died and the experiences of survivors which can be found here.